The video begins with Becca and Ryan in the ring toweling off after a training session. They compliment each other on a great workout and how much they enjoy wrestling each other. As they leave the ring Ryan compliments Becca on her abilities. “Wow! You really think I’m the best wrestler at FWR?” Ryan smiles and says “That’s not what I said. 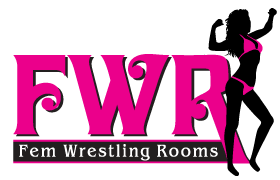 I think you’re the second-best wrestler at FWR.” Becca stops, backs up into the ring and makes the challenge … “No audience, no ref, and no scripts.” Ryan accepts and they tear into each other. The action goes back and forth with each girl delivering punishing holds. They both manage plenty of escapes and near pins but only one girl can win this match. You’ll see some great fast-action wrestling that culminates in a cradle lay-over pin from Ryan to Becca. Ryan helps Becca to her feet and the two women leave the ring with mutual respect for each other … and a final little fun ending that will make you smile. Enjoy! Get this 8.5 minute, 259MB video for only $8.95!